A great film by a great director and underrated actor, Ben Affleck. The action sequences were great, it really put us in the middle of the action. My only problem was the ending, I think they all should've died at Fenway or he gets caught trying to escape. Also, what was up with Jon Hamm's hair? I am really impressed by Affleck's directing. This movie turned out to be a well thought out and executed movie. I found this to surpass 'The Departed'. Believable characters and a thrilling ride. This is worth the watch and more. The shootouts and car chases make this movie an exciting watch, and the brains behind the writing make it a fulfilling one. I am excited to see more Affleck directed films. Ben Affleck is Doug, the leader of a successful, accomplished bank robber crew composed of longtime friends who have operated as a group for some time. During one particular job, they grab a hostage Claire (Rebecca Hall) into the getaway truck just in case, but drop her off after they have shaken off police pursuit. Unfortunately she lives right in the neighborhood, hence a sufficiently significant risk for the gang to have Doug befriend her at a "chance meeting" to see if there is any danger that she might recognize one of them (despite their masks and her blindfold). 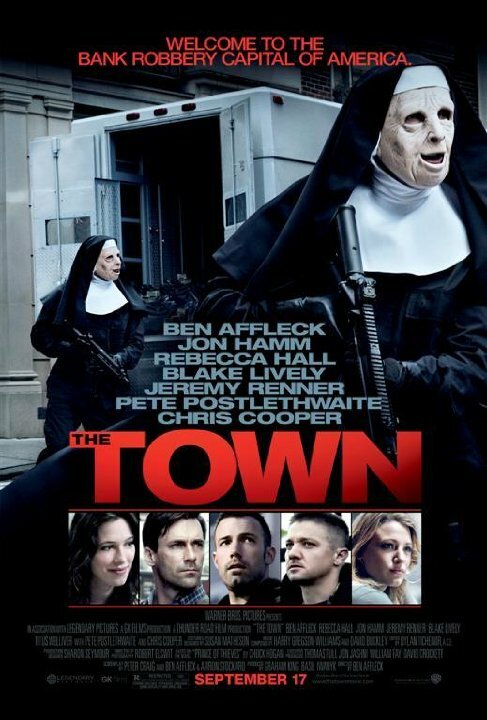 I feel that The Town had the potential for being a very good, or even a great movie right up there with West Side Story, but it fell woefully short of that potential, due to a mediocre cast, an immature script, an ending that fell flat, and the persistence of stereotypes, as well as many over-the-top shoot-out scenes. &amp;nbsp;I also dislike the message that The Town conveys to me personally; &amp;nbsp;that people don't have to be held accountable for what they do, and that anything goes. Gone Baby Gone I watch the trail of the movie. Nice trail. I will watch the full movie. Gone Baby Gone was a much better film than The Town, and Ben Affleck's brother, Casey, is a far better, more talented actor.